Alberto Contador (Tinkoff-Saxo) appeared less Grand Tour machine and more human for 30 kilometres of the 2015 Giro d’Italia on Saturday, which he should still win tomorrow in Milan. He said after the stage that he was suffering from an ‘off day’. The Spaniard in the race leader’s pink jersey struggled on the race’s highest climb, the Colle delle Finestre, after his rivals attacked and he lost around one minute. However, he managed himself on the gravel roads, rode the descent with the calm of a Grand Tour champion and finished the stage 2-25 minutes behind winner Fabio Aru (Astana). Contador still maintains a 2-02 lead over Aru with only the flat stage to Milan remaining. “He passed a really bad moment with three kilometres to go, he was isolated so it was hard for him,” sports director, Steven De Jongh said outside the Tinkoff-Saxo bus. Astana’s Aru and Mikel Landa, sitting second and third overall, rode away and threatened Contador’s run to a seventh Grand Tour win. After the summit of Finestre, at 2178 metres, Contador regained control and managed his ride to the Sestriere ski station. The 18.5-kilomtre climb ends with eight kilometres of gravel roads. The Giro first used it in the 2005 edition and again in 2011. “It was hard day for me, the Colle delle Finestre showed once again why it is so popular in cycling,” Contador explained. Contador is the most successful Grand Tour rider of this generation. He last won the Giro in 2011, but that title and the 2010 Tour de France title were taken away for a doping suspension. He still has his 2008 Giro trophy, however. Besides the Giro, he counts two Tour de France and three Vuelta a España wins. He took over the Giro lead in Abetone and never made a mistake along the way. Only a crash and a dislocated shoulder in the sixth stage sprint finish threatened his lead. Other rivals crashed and abandoned like Sky’s Richie Porte, and Aru and Landa were often several steps off Contador’s pace. 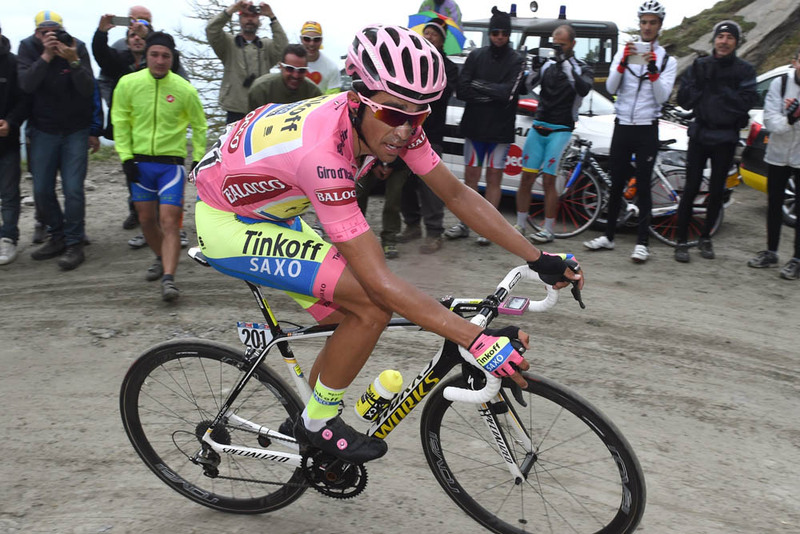 Contador aims to become only the eighth cyclist in history to win the Giro/Tour double this year. After tomorrow, he will have made the first step towards that goal.